In 1927 a program for training the adult lay members of the church to minister to the youth of the church was officially approved. This program was named Master Comrade. The very first Master Comrade Investiture took place in 1931. Twenty years later, in 1951, the name was changed from Master Comrade to Master Guide. Through the years several changes and modifications were made to the program. At one period in time the program was split into two tracks, Junior Youth and Senior Youth. “The Master Guide Course has been structured as a natural flow from the Guide course and its content is such as would have appeal and interest to a 16 to 19 year old. It was felt that the Pathfinder organization would be failing if it did not promote a course that encouraged young people beyond the Pathfinder age to continue with the Club and become aware of the value of leadership skills. Because of its closely connected work with Pathfinders, this class is seen as a transition between Pathfinder ministry and senior youth ministry. It is expected that those in the Master Guide program be active in church activities relating to Pathfinder age children. This “new” Master Guide was almost immediately and universally rejected by the constituents of the North American Division. It was rejected for the obvious reason that the word “MASTER” has real meaning. It means that the bearer of that label is a highly trained and experienced person, not a beginner. When one hears the term Master Mechanic he/she expects to have a trained and experienced person working on their car, not someone who is beginning to learn the trade. When the North American Division Pathfinder Committee was formed in 1992 it was given a mandate to restore the “old” Master Guide program, updating and modernizing it in the process. 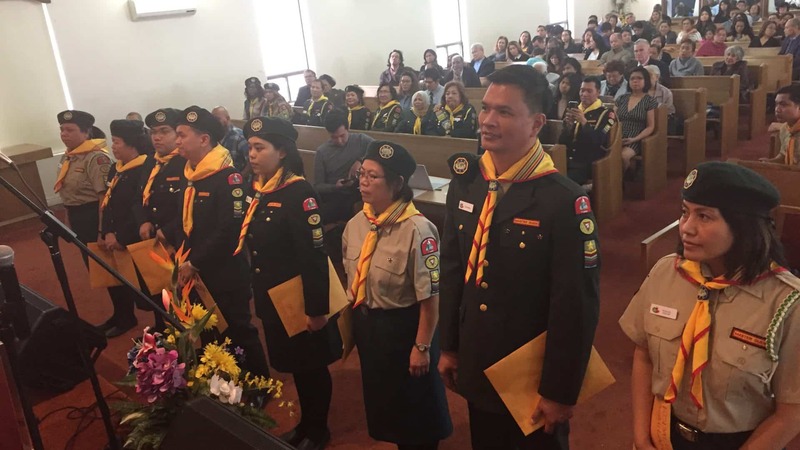 The committee was instructed to make the program challenging, adult oriented and not restricted to the Pathfinder program but connected to all aspects of youth ministry in the church. The current Master Guide program (1994) and Master Guide Manual (1996) is the result. The current program is designed to provide thorough training of adults to minister to the youth of the church. The Master Guide program is not an advanced class level for the AY Guide class. When a person is invested as a Master Guide he/she will have completed at least one full year as a regular Adventurer or Pathfinder Club staff, he/she will have taught, on his/her own, at least two AY Honors or three Adventurer Awards, he/she will have a thorough knowledge of Adventist Heritage and beliefs, he/she will understand the age group to which he/she is ministering, and he/she will have training in communication and leadership skills. In other words, when a person is actually invested as a Master Guide he/she is to have the training and experience necessary to accept to the responsibilities of youth leadership. It is the top youth ministry award in the church. All other training programs are to enhance it and provide additional skills in particular areas. Master Guides took initiative in organizing the Toronto Pathfinder Federation with David Clarke as director. Members of the Federation include Toronto East, Toronto West, Toronto Perth and Mississauga clubs. Pastor Gordon Pifher, conference youth director at that time, expanded the Federation by merging the Adventist Youth (AY) and Pathfinder leaders into one organization. The Federation was changed to Pathfinder Council with David Clarke as Executive Coordinator, Ruth Weidner as secretary, and Letitia Ince de Rue – Osborne as treasurer. Russell Lambert was voted as Executive Coordinator for the Ontario Conference Pathfinder Council (OCPC). Pastors Cyril Millett III and Charles Leader were elected as Conference Youth and Associate Youth Directors. Chris Grant elected as OCPC Executive Coordinator. Initially, the position of Master Guide Representative to the OCPC was held by Janice Maitland. Later, Letitia Ince de Rue-Osborne accepted the said responsibility and coordinated the work among Master Guides. Alex Rowe voted in as OCPC Executive Coordinator with Janice Maitland as Assistant to the Executive Coordinators. The Master Guide-in-Training (MIT) program was spearheaded by the District Coordinators. Mavis Griffin served as Master Guide Representative to the OCPC Executive Committee. The OCPC, during its annual convention on October 18th at the Agape Temple Church in Pickering, has approved the proposal to set a Master Guide Council separate from the OCPC to be overseen by the Youth Department. Pastor Cyril Millett III was re-elected as conference youth director. Voted in as associate youth directors were Pastors Edwin Martin (Adventurer and Pathfinder Ministries) and Glenn DeSilva (Camp and Men’s Ministries). On March 15th, the Remnant Light Bearers was organized under the leadership of Mavis Griffin, Metro Central Pathfinder district coordinator. Russell Lambert was elected again as OCPC Executive Coordinator with Ermine Leader and Chester Lewis as assistants. A Brainstorming Session regarding the formulation of Terms of Reference for the proposed Master Guide Council was held on September 5th in Oshawa which was presided over by Pastor Millett with Pastor Martin as recording secretary. In attendance were the following representatives from the Adventurer and Pathfinder ministries: Russell Lambert, Velma Morgan, Oliver Bucknor, Ermine Leader, Adina Ryan, Mavis Griffin, Pamela Boreland, Marcia Martin-Thomas, and Chester Lewis. Survey conducted by the Youth Department showed that there were 210 invested Master Guides in Ontario. The Adventurer Master Guide program was implemented resulting to the investiture of 7 MGs from the Metro Central District. On Sept. 10-12, OCPC Leadership and Training Committee, under the leadership of Ermine Leader, spearheaded a Master Guide Refresher Campout at Rattlesnake Point Conservation Area. District Coordinators – Rosendo Cuizon (Metro Central), Richard Jules (Metro East), Marcia Martin-Thomas (Metro West), Bert Officer (Durham). Later added were Richard Pyne (Peel/Southwest), Leonard Abbott (Northern) and Yves Thelys (Eastern). OCMGC Terms of Reference ratified. Adventurer Leadership Growth (ALG) program was introduced by the North American Division (NAD) with Velma Morgan as the first Master Guide to complete the requirements in the Ontario Conference. 1st Mission-Service Project held in Elliot Lake, ON on Nov. 3-6. OCMGC initiated the 1st Master Guide Heritage Tour to Battle Creek and Berrien Springs, Michigan. The 1st OCMGC-sponsored Master Guide Campout was held at Warsaw Caves Conservation Area. 2nd Master Guide Convention held at the Canada Christian College in Toronto on May 25-27. Workshops for MG Refresher, Pathfinder Leadership Award and Adventurer Leadership Growth courses were conducted. On March 10-12, the NAD Youth Department during the annual YPAC Leadership Summit in Lincoln, NE, has approved the restructuring of the Master Guide program as a ministry. Master Guides underwent training for Disaster Preparedness and Response. The 1st MG Recertification Program was held at Camp Samac, Oshawa with 140 MGs in attendance. The Master Guide was recognized as a department in alignment with the Adventurer and Pathfinder ministries. Pastor Edwin Martin was elected as Director of the Adventurer, Pathfinder, and Master Guide Mministries of the Ontario Conference on August 24th. In January, the Master Guide Leadership Course was handled by the various district MG clubs under the supervision of the OCMGC using the new MG curriculum. MITs, from that time on, were referred to as MGTs (Master Guide Trainees). On April 25-27, the 4th Master Guide Convention was held at the Canadian Christian College (Friday-Sabbath) and Downsview Adventist Church (Sunday). Master Guides took part in Clean Up Operations during the 2015 Pan Am Games held in July and August in Toronto and other neighboring municipalities. MG Mission trip to Moosonoee, ON on August 14-23 participated in by Pastor Edwin Martin, Bert Officer, Judith Mosomi, Eva Bekkout, Juliet John, and Wendy Guzman (with son, Hector). Training program offered to 1st and 2nd year MGTs as well as recertification and continuing education for MGs at the “Here I Am” MG Convention held on April 2-3 at CAA East Campus in Pickering. Master Guide Convention/ OCMGC Triennial General Meeting with the theme, “Vanguard of Truth,” was held on April 29-30 at CAA East Campus in Pickering. OCMGC Terms of Reference revised. The concept of church-based MG club and district MG association approved. Master Guides participate in the AMP Year of Evangelism.